Thus far there have been at least a dozen attempts to set The Winter’s Tale as an opera, though none of them has enjoyed lasting success. Setting his own adaptation of Shakespeare’s text in this world premiere, Ryan Wigglesworth conducts his own version, which also represents the first directorial assignment for Rory Kinnear. From several points of view the result is clearly the major event of ENO’s current season. It certainly has a lot going for it. Kinnear offers an intelligent reading of the much rewritten, cut-down text – Autolycus is one of the major Shakespearean elements to disappear completely – demonstrating considerably more savoir faire than many experienced practitioners of operatic staging. 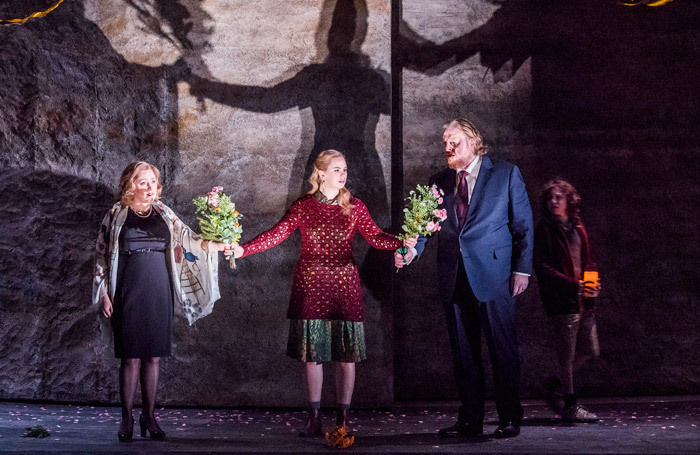 Vicki Mortimer’s sets and Moritz Junge’s costumes suggest authoritarian societies of the mid-20th century for both Sicilia and Bohemia, respectively ruled with destructive patriarchal zeal by Iain Paterson’s insanely jealous Leontes and Leigh Melrose’s control-freak Polixenes. Other individual performances are equally strong, with Sophie Bevan a dignified Hermione, Neal Davies doubling convincingly as Antigonus and the Shepherd, and Susan Bickley’s Paulina consistently rising to eloquent heights. The younger generation is represented by Samantha Price’s spontaneous Perdita and Anthony Gregory’s exuberant Florizel. Benefiting from the full commitment of ENO’s excellent orchestra and chorus, Wigglesworth’s score is an accomplished piece of work, demonstrating in this debut opera the skills that have earned him a high-ranking position amongst British composers of his generation. Yet however finely achieved the result may be, it rarely maximises the operatic potential of the material. Pressing urgently onwards towards the next unexpected narrative twist may be a plus, but there are times when a more expansive musical response is needed. From many points of view this is an admirable evening, but it seems that the play has once again eluded the operatic medium.